Mr. Clough attended Boston University for Music Performance, and has been teaching for 30 years. He teaches all brass and piano in the MetroWest area, as well as coaches brass ensembles and pep bands. In addition to teaching, Ed is a freelance trombonist in the Boston area, and has performed with pop bands on keyboards and vocals. 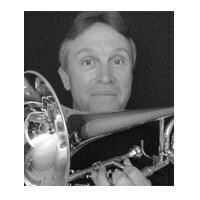 He is one of the founding members of Boston Brass and performed with them for 20 years. Ed likes to use "music theory, history and even singing to give his students a complete grasp of music performance". Part of Ed's educational philosophy is "my purpose in teaching is to expose the limitless joy of music in a progression that fits each student's unique ability and ambition. I give full attention to the problem of making everything in music known and understood so that the music may be felt."